The method, which doesn’t require the camera to take an actual photograph of the object, can be used with any form of light in which color modulation is possible with individual RGB channels, including light from projectors. It can work with any LED equipped with color modulators, which are widespread and inexpensive, Nakagawa said. The ID embedding technology is in some ways similar to QR codes, NFC tags and visible light communication (VLC), a data communications method that can also be triggered by LEDs. Although the data speed of the LED method is relatively low at 10bps, it doesn’t require a tag that alters the appearance of the object, Nakagawa said, adding that LEDs are also an attractive vector because they are becoming ubiquitous. For instance, a performer could walk onto a stage lit by LEDs and anyone in the audience could point a smartphone at the show and download the song he or she is singing, according to Fujitsu. Another example would be encoding an ID in LED lighting for a historical exhibit that triggers text about it to be displayed in a user’s native language. 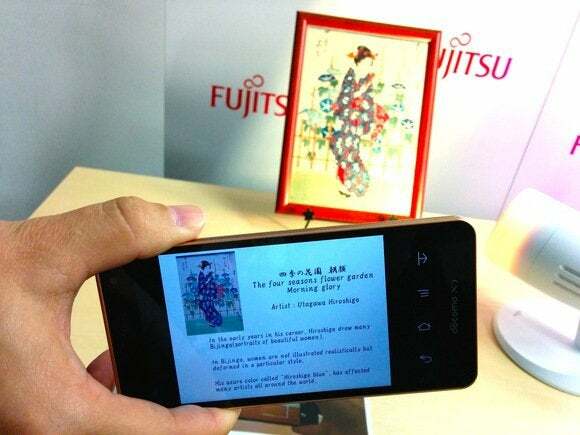 Fujitsu is testing the technology in various applications to improve its accuracy and aims to commercialize it during its fiscal 2015, which ends March 31, 2016. Last year, the company commercialized a similar technology that allows product information to be displayed when smartphones are aimed at TVs. It’s being used by major Japanese TV home shopping firm Japanet Takata.